Sign up now to receive our bi-monthly e-publication with exclusive content and download offers. KCTS can provide you with the tools and knowledge to assist you with the management of your improvement programs, adding real value to your work. Click on the image below to view the latest KCTS Resource. To take advantage of this bi-monthly resource, including up-to-date information, worksheets, how to do sheets, basic tools, templates, software trials, consultant tips and much more, then register for The KCTS Resource. -------o--Click here to view our May edition of The KCTS Resource. -------o--Click here to view our June edition of The KCTS Resource. 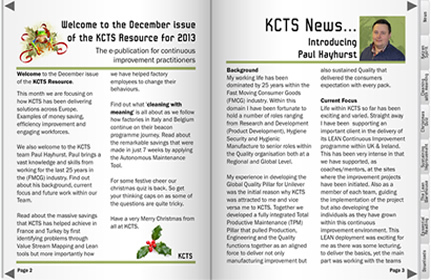 -------o--Click here to view our December edition of The KCTS Resource. -------o--Click here to view our September edition of The KCTS Resource. -------o--Click here to view our April edition of The KCTS Resource. -------o--Click here to view our February edition of The KCTS Resource. -------o--Click here to view our October edition of The KCTS Resource. -------o--Click here to view our July edition of The KCTS Resource. -------o--Click here to view our March edition of The KCTS Resource. -------o--Click here to view our August edition of The KCTS Resource. -------o--to achieve a reduction incurrent losses by 60% within a 1 month period. -------o--Line 4 across the other two lines.